Ed Hawkins’s Polar Plot animation of warming had a big impact. So I thought I would try the same trick with the 200,000 year record of temperature anomalies from Antarctica measured by the EPICA ice core data. 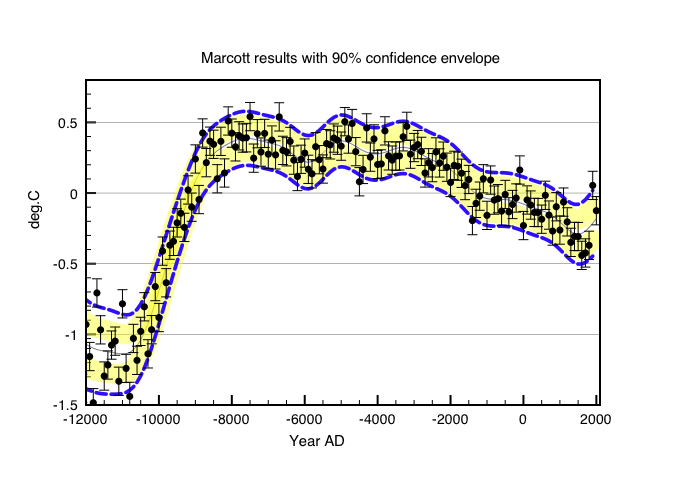 The Epica temperature data for last 200k years. The first rapid warming is the Eemian interglacial followed by the last glaciation and the Holocene. The circle represents todays average temperature (1961-1990 normals offset by 10C). Yellow for mean temperature > 4C (-6C) Red for mean temperature >8C (-2C) and Blue for mean temperature < 4C (-6C). At its peak the Eemian was 3C warmer than the Holocene. The animation shows that natural climate change still dwarfs any recent man-made warming (~1C). This entry was posted in climate science, Science and tagged Climate Change. Bookmark the permalink. “The circle represents todays average temperature (1961-1990 normals offset by 10C). Yellow for mean temperature > 4C (-6C) Red for mean temperature >8C (-2C) and Blue for mean temperature < 4C (-6C)." Why is there a 10C offset and what are the measurements in parentheses? The main reason is that you can’t really have a negative radius in a polar plot. During the LGM temperature anomalies minimized at around -10C. To get round this problem I simply added 10C to all the EPICA temperature ‘anomalies’. Ed Hawkins plot has exactly the same problem. He also arbitrarily selects the value of the central point. Any value below the minimum is a singularity. OK. Sorry. Parentheses is the offset from the 10C line. 1. 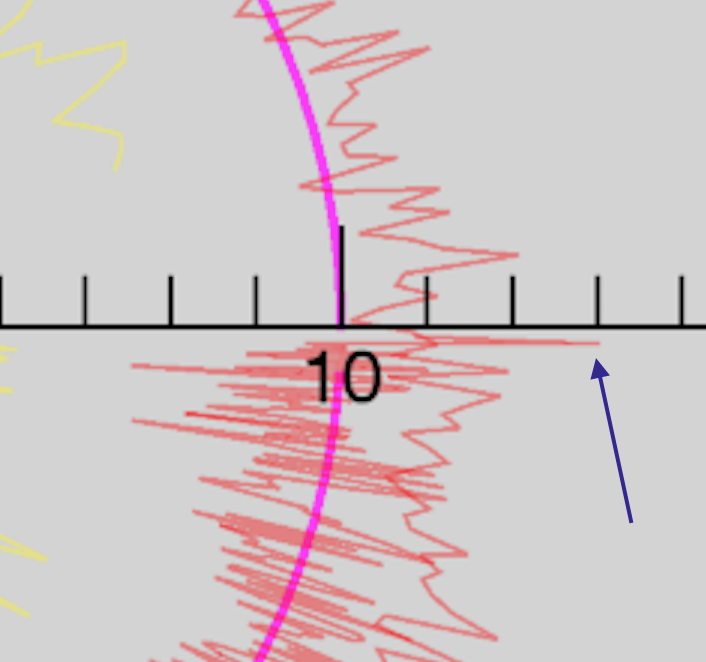 What is (time) scale on circumference? Looks like might be around 18,000 years, but moves too fast to tell. 2. What is minimum resolution of time data? Really moves too fast to tell that, but looks like could not possibly be lower than decade, and, even at the decade level, where did data with such resolution come from for past millennia? 3. Does this plot not evade the point with respect to anthropogenic climate change (warming) in that if it is occurring it would only have been in the last century at most, functionally more likely last few decades at most? Would it not be more informative to look at past time intervals of similar length in which there was similar apparent temperature change? For example, by my observation the last two (or few, since I have no idea what the time resolution is) data points on the plot seem to suggest clearly aberrant temperature increase compared to nearly all, perhaps all, of the data in the prior parts of the plot. Time scale is determined by EPICA. To keep it simple I just took a series of 37 values from around -205,000 years ago. The time span of each block varies with time. However I calculate the angular values by dividing 2PI into 37 equal values dependent on age. Therefore the net effect is accurate. It’s all a bit of a hack. I use IDL. Here is the code if you are interested. I am sure it could be made much better with a bit of polishing. Pingback: We should be so thankful for AGW skeptics | The Blast! Clive, if you zoom into the last 100 years, you see a huge fluctuation in the temperature. The problem is not the absolute temperature, but the rate of change – which is faster than many systems can adapt to. There are other large fluctuations in your graph, but I’d love to see the rate of extinctions plotted against those ones! Marcott et al and Pages 2000 studied proxy data from around the world and reconstructed global temperatures for the holocene. The holocene maximum temperatures were about 6000 years ago when Northern Hemisphere summer coincided with closest approach to the sun. Today that now coincides with the Southern Hemisphere which is one reason Australia has such hot summers. Both Marcott and Pages produced an uptick in temperatures for the last 100 years, although Marcott’s uptick was mostly an artifact. This is what I got analysing their data. There is an uptick but nowhere near as accentuated as the original. In any case the temperature data show a rise of about 1C in global temperatures since 1850, and that will rise probably another 1C by 2100. The trouble is I don’t know what the hell we can do about it in the next 50 years. Probably in Australia solar energy makes a lot of sense, but it is next to useless in the UK. Wind energy can’t work either. Long term like it or not it’s either nuclear or bust. Incidentally you can add an image to a comment by putting the url on a line by itself. That is what I did above. Images get scaled to a fixed width by the plugin – which is not so good in the case of the zoom-in. Thanks for reiterating my point more directly, hence, clearly. To your last points about next 100 years. You are, in my opinion, optimistic about a likely time course of temperature change. And, even your optimistic rate is, as Greg describes, too much too fast for many systems we know and depend on. Further, the next 100 years temperature change is probably already a done deal. There is sufficient momentum in the climate/human economic system that another 1C over the next 100 years is almost certainly inevitable, and little within an achievable range of change will substantively alter the minimal change of the next 100 years. Perhaps we could make some interim difference by aggressively addressing short term climate forcings (methane, N2O, etc. ), but the die is effectively cast. So, can we not get serious and consider the issue that the bulk, and perhaps all, the benefits of whatever efforts we expend in the next 50 years will actually accrue to those who are not alive today? Do we have the right to commit our yet-to-be-conceived progeny to the conditions that we are? If we cannot stop what we are doing to mitigate what is happening to those who are alive now, where are we going to find the self-discipline to act meaningfully in a manner that will show no economic return until all those who are alive now will almost certainly be dead? It seems to me we have a more fundamental and difficult question to answer than mere technological issues such as nukes, not-nukes, all of the above minus fossil, etc. The climate was actually slightly warmer 8000 years ago during the Holocene optimum when the closest approach to the sun of earth’s orbit coincided with Northern summers. Human civilization fits neatly into the holocene beginning with the development of agriculture. For a million years before that our ancestors scraped an existence migrating between ice ages. The basic problem with man is that we learned to use fire. This gave us power over all other species and enabled us to control the environment through deforestation. The industrial revolution gave us enormous power through burning fossil fuels. As a result we have already had a huge impact on nature and the earth. Climate change is just another example of that impact. I don’t necessarily think it is worse than the other impacts of man like deforestation, fishing and farming. Probably there are just too many of us but reducing population is hardly an option..
How much warming will a doubling of CO2 to 560 ppm bring ? You can calculate the direct greenhouse warming using line by line radiative transfer through the atmosphere. I did it to understand the physics. The answer is about 1.1C per doubling. Warmer seas bring more evaporation which leads to both an enhanced greenhouse effect (H2O) and more clouds. More moisture also reduces the lapse rate which offsets some of the greenhouse effect. The problem is we just don’t know what the climate sensitivity really is. Perhaps it is as low as 1.5C and perhaps it is as high as 5C. There has been no real progress on this for over 30 years. 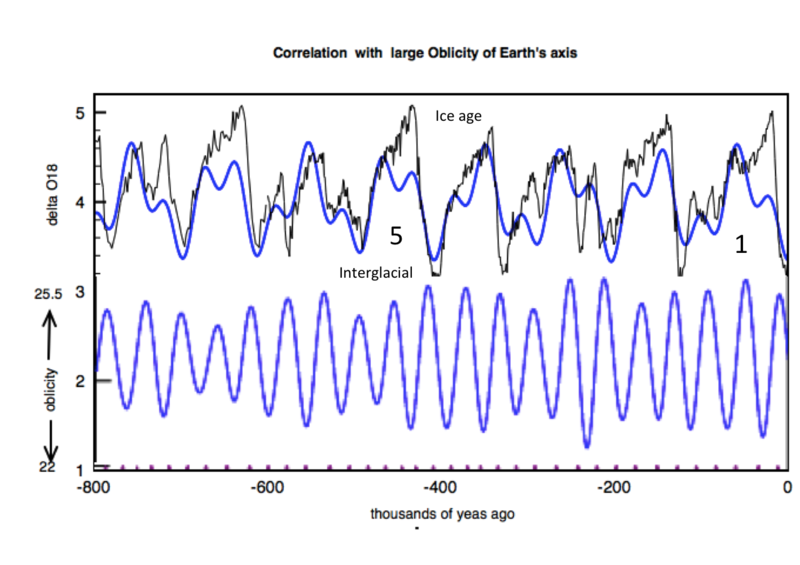 However we know that the last interglacial (Eemian) was about 3C warmer at its peak than today. Sea level was probably 3-4 meters higher then. In fact you can see this at Braunton Burrows in Devon where the old beach sits about 3 meters above the current one. The next glaciation should begin within 5000 years time. We are very lucky that the earth’s orbit is currently nearly circular, otherwise another ice age would already be underway. By increasing CO2 levels we cause a small reduction in IR cooling to space which leads to a small increase in surface temperature to rebalance energy. If we can eventually learn how to control CO2 levels we could turn this round to our advantage and delay another glacial cycle indefinitely. Before that we have to stabilize CO2 levels preferably below 600 ppm which should limit warming to 2-3C or about the same as the Eemian. Sea level rise would be about 3-4 meters but only in a couple of thousand years time, unless CO2 levels reduce naturally. Do we have the right to commit our yet-to-be-conceived progeny to the conditions that we are? If we cannot stop what we are doing to mitigate what is happening to those who are alive now, where are we going to find the self-discipline to act meaningfully in a manner that will show no economic return until all those who are alive now will almost certainly be dead? It seems to me we have a more fundamental and difficult question to answer than mere technological issues such as nukes, not-nukes, all of the above minus fossil, etc. The problem is you have to take action that makes sense and where the numbers actually add up. Otherwise the end result is to stop the modern world and increase the death rate. That is one solution but it is not recommended. If we need to take action “that makes sense and where the numbers actually add up”, then the first step would seem to be agreeing on what makes sense and where the numbers actually add up. For my part, I am uncomfortable with the notion that the current human socio-economic civilization is in almost any way comparable to human conditions that have come before, in the Holocene or prior. You propose that, “Otherwise the end result is to stop the modern world and increase the death rate. That is one solution but it is not recommended.” Which seems to beg the response, “But is that not among the more likely potential consequences of staying on the present course?” It seems to me that among those who are concerned, regardless of how they see the numbers adding up, the not-recommended solution, is not regarded as a solution at all, but actually the problem that we are concerned to avoid. Perhaps the discussion does actually only involve two positions, humans will be able to either (1) comfortably adapt to whatever they have wrought on the earth, or, (2) not, i.e., there is a ecosystem limit to the adaptive range of human society as we know it. If you hold to (1), then the climate change discussion is much ado about nothing. If you hold to (2), then the question is are we approaching an ecosystem limit. The scary part to me is reasonably well illustrated by your statement, “…we have already had a huge impact on nature and the earth. Climate change is just another example of that impact. I don’t necessarily think it is worse than the other impacts of man like deforestation, fishing and farming.” It seems a pointless discussion to concern ourselves with which particular one or several of human impacts are worse, when the critical issue is the cumulative effect of them all on our opportunity to continue our existence at something near our present quality of life (which is not all that high in many parts of the world). When you have dug yourself into a hole it is probably not a good idea to just keep digging in the same direction. Human population must stabilize naturally within the next 50 years or so, independent of climate change. Otherwise there could be some human induced catastrophe such as a nuclear war. In fact the greatest fear until the mid 1980s was the possibility of all out Nuclear War between the West and the Soviet Union. This nearly happened during the Cuban missile crisis. I read recently that the Russians actually already had nuclear warheads in Cuba when Kennedy ordered the sea blockade to stop them arriving. Luckily for us Khrushchev backed down anyway. Now the great fear is climate change but the threat is slow moving and uncertain. Human nature being the way it is, all easily extracted coal will eventually be burned unless we can develop a cheaper high energy density source. It has to be high density to avoid yet more damage to the land surface by man. Biofuels has to be the most crazy idea of all. It is causing the destruction of the remaining rainforest in Borneo to plant Palm oil for Biodiesel. I am interested in this. The official version showed by the Marcott et al., 2013 figure that you show and the PAGES 2000 is that the Holocene maximum was +0.4°K anomaly and the LIA -0.3°K anomaly, so the entire Holocene variability is 0.7°K. AFAIK nobody has contested this Holocene temperature range in the literature for almost 3 years. As the temperature anomaly now is stated to be about +0.8°K this implies that we are now about +0.4°K above Holocene maximum or about 50% above the entire Holocene temperature range. This is as of today the only position that can be defended on scientific literature and I would like to know your opinion on this. – Sea surface temperatures in the Indo-Pacific Warm Pool. – The state of the cryosphere where glaciers and small ice patches are far from their Holocene minimum. – Treeline has not readvanced to Holocene maximum levels. – We are far below the Holocene sea-level highstand. I see no way to solve this conundrum. Either we have not warmed +0.8°K and our instrumental record is faulty, or the Holocene maximum was a lot warmer than +0.4°K, clearly >+1.0°K, and our proxy record is faulty. I am surprised that this is not being discussed more openly since a lot of scientists are working on paleoclimatology with records that show that we cannot be warmer than the Holocene maximum. Are we going to ignore this issue? I have another suggestion. The instrument data that are combined into calculating the global temperature anomaly are actually based on average daily temperatures at each location. This is simply (Tmax – Tmin)/2 , where Tmax is the maximum temperature recorded on that day and Tmin the lowest recoded that night. This is then averaged for each month and anomalies derived relative to a 30 year average ‘normal’. I remember reading in several papers that it is Tmin that is increasing rather than Tmax. During the day the sun heats the surface causing convection and evaporation which transport heat up to the top of the troposphere where it can radiates to space. During the night convection stops and the surface can only cool by IR radiation through the atmosphere. So increasing CO2 reduces cooling only at night. This is different to the holocene maximum because the sun only heats during the day. The Holocene maximum coincided with maximum obliquity of the earth. This causes both polar regions to receive more insolation during summer and all the earth’s climate zones to increase in size. The tropics increased in size by about 4 degrees in latitude and likewise the arctic/antarctic circles expand by ~ 2 degrees. The effect of precession is suppressed by the low eccentricity of the earth’s orbit and mainly determines which pole gets a higher maximum insolation. 8-10,000 years ago the climate was very different to today. Monsoon rain reached the Sahara which was covered in Savanah and humans settlements flourished in what is now desert. Likewise the ‘ice man’ discovered in Italy was happily walking around the Alps at the same time. The tropics were probably no warmer than they are today as the solar constant hasn’t changed. However the temperature gradient to the poles was much reduced. This may be why the net global warming was only about half a degree of warming, but high latitudes would have been much (several degrees) warmer. Interestingly the precession has been reducing since then and is due to reach a minimum in about 15,000 years time. This must trigger another glaciation sometime between now and 15,000 years time, although precession may help us as northern hemisphere maximum insolation is starting to increase slightly. CO2 greenhouse warming is a totally different effect. It should affect all regions equally but convection and weather will still tend to move heat away from the tropics. I think it is true that minimum temperatures have increased whereas maximum temperatures haven’t. So there is slightly less IR cooling at night and in polar winters than previously. If we accept that there has been a net global warming of 0.8C, then it is noticeable that there has been no significant shift in climate zones. Likewise we don’t see the other effects you mention. I suspect the answer is that at higher latitudes the Holocene maximum was much warmer (1-2C) than now, but the tropics were not that different. Perhaps that explains the +0.4C from Marcott and Page 2K. Alternatively their proxies simply wash out the peaks anyway. Hmm. This is a little confusing. If the tropics were about the same, but the temperature gradient to the poles was much reduced, and hence higher latitudes were significantly warmer, then the average temperature 8 kyr ago should have been higher than now, not lower. To be lower some part has had to be significantly cooler. Another possibility is that current warming is due to winter lows and night lows getting higher, something that would not be adequately registered in biological proxies that mainly respond to spring-summer and day temperatures. This would go in the line of my suggestion that proxy degrees and instrumental degrees are different things and cannot be compared. Interestingly the precession has been reducing since then and is due to reach a minimum in about 15,000 years time. I suppose you refer to obliquity. I fully agree. It is actually falling near its maximum rate. Also eccentricity is very low at 0.016. Well below its mean value. We should expect that precession has a very reduced effect and to make matters worse, its northern summer solstice component is at a minimum. So nothing is going to compensate falling obliquity for the next few millennia. While everybody is looking at CO2 the North Atlantic marine proxies are indicating ongoing progressive summer cooling. Sorry-Yes I did mean ‘obliquity’ has been reducing which will lead to the next glaciation. It is precisely because eccentricity is low in the current epoch than the N-S precession effect is small. For some reason orthodoxy Milankovitch theory has become focussed just on summer insolation maxima at 65N, which is too simplistic. Minimum obliquity will be reached in 15000 years by which time we would naturally be 100m under ice sheets across Northern Europe Asia and America. For the tropics high obliquity introduces more seasonality. Wikipedia says it will be 11,800 years. Currently the Earth is tilted at 23.44 degrees from its orbital plane, roughly halfway between its extreme values. The tilt is in the decreasing phase of its cycle, and will reach its minimum value around the year 11,800 CE. We are in the steepest decline rate now and most past interglacials ended at about this point. That’s right – glaciations do end when obliquely reaches steepest decline but also when northern summer insolation increases. So probably sometime within the next 5000 y. Correction: 11,800 CE is just ~9,800 years from now. Clive, Hansen and Sato (2011,2012) claims the diagnose ECS as ~3C by assuming that since GHG and albido from land ice are both forcings, measured in Watts/M(2), that they are interchangeable in use for energy calculation. “An increase of 1W/m2 in solar energy is a smaller increase in net entropy radiation ~DQ/T where T 5000K. An increase in GHG ‘forcing’ is a much larger increase in entropy ~DQ/T where T= 288K” here. In light of your comment is there more energy in solar, albido and incoming shortwave feedbacks Watt for Watt than changes in GHG and outgoing longwave radiation (OLR)? Could Hansen and Sato’s assumption be wrong? Hansen and Sato is a study of the Last Glacial Maximum (LGM) about 20k years ago. By assuming the temp was -5C from the Holocene and knowing the ice coverage and GHG they gain an empirical estimate of ECS of 3C. This is pointed to by the consensus as important confirmation of the IPCC best estimate from their model mean of 3C ECS. Also, being and empirical study it’s used as a rebuttal to the empirical studies of the last 160-yr record which infer a lower ECS of around 2C.